UNITED NATIONS, December 15 -- While the International Monetary Fund is often loath to speak about human rights situations in countries, Thursday when Inner City Press asked IMF spokesman David Hawley about Hungary's Prime Minister Viktor Orban's move to assert control over the nation's central bank, Hawley was ready with an answer. HAWLEY: "a question from Matthew Lee at Inner-City Press on Hungary. His question is How would relations and a program with the IMF be impacted by the prime minister's announced plan to assert control over the central bank and demote its president? I can answer that by saying that we are carefully examining the recent legislative proposals with respect to the central bank and erosion of central bank independence would be of great concern." It's worth noting that one proposal, to combine central bank functions with bank regulation, is already the case at the US Federal Reserve, which the IMF does not criticize. Inner City Press also asked, "now that the South Sudan National Legislative Assembly on Dec. 13 voted to join the IMF, what are the next steps and what can the IMF do for South Sudan?" HAWLEY: "Matthew Lee of Inner-City Press notes that South Sudan intends to join the IMF and what are the next steps and what can the IMF do for South Sudan? 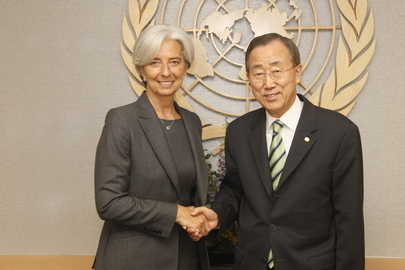 Discussions or work on South Sudan becoming a full member of the IMF are well advanced. South Sudan's main challenges are maintaining economic stability, investing its oil resources wisely in social and infrastructure development and to build an environment and institutions to support sustained economic development. In terms of what we're doing to support these policy goals, we're stepping up on our technical policy advice in areas where the Fund has expertise and we have a resident adviser now in the country." The Director of the IMF's Africa Department IMF's Antoinette Monsio Sayeh was on the schedule December 14 at the International Engagement Conference for South Sudan, on topics including "Transparency." But at the December 15 IMF briefing, Hawley was asked when Managing Director Lagarde will make herself available for questions from those covering the IMF, with the complaint made that she has hardly been available since she took over in June. Hawley said this would be "taken on board." We'll see.